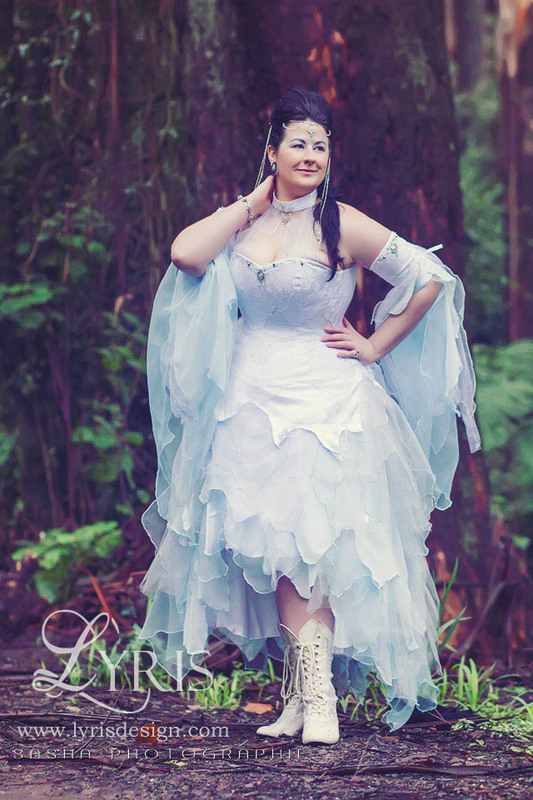 My name is Carly, and I am the force behind Lyris Design, a bespoke corsetry and couture label based in Australia. The design is inspired by the mythos of the Goblin Ball, which centers on four elemental kingdoms. 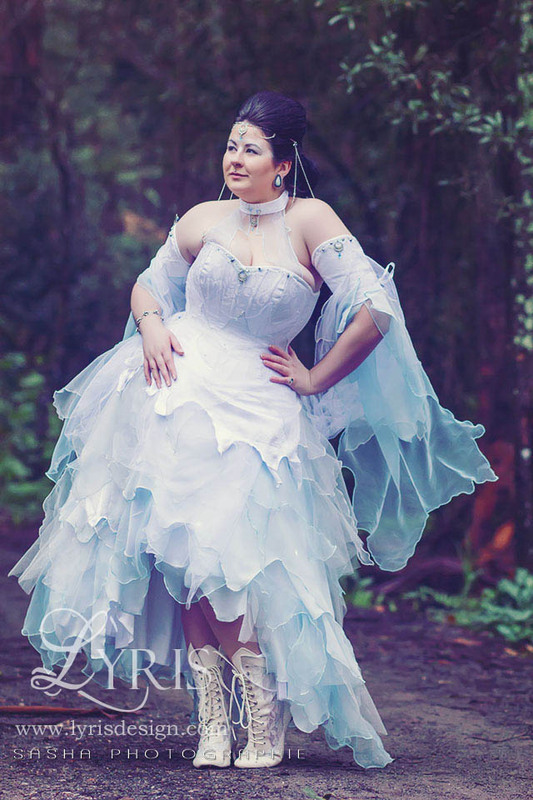 Eden’s persona was a moon princess from the sky kingdom, so I designed her corset gown to reflect these ideas. 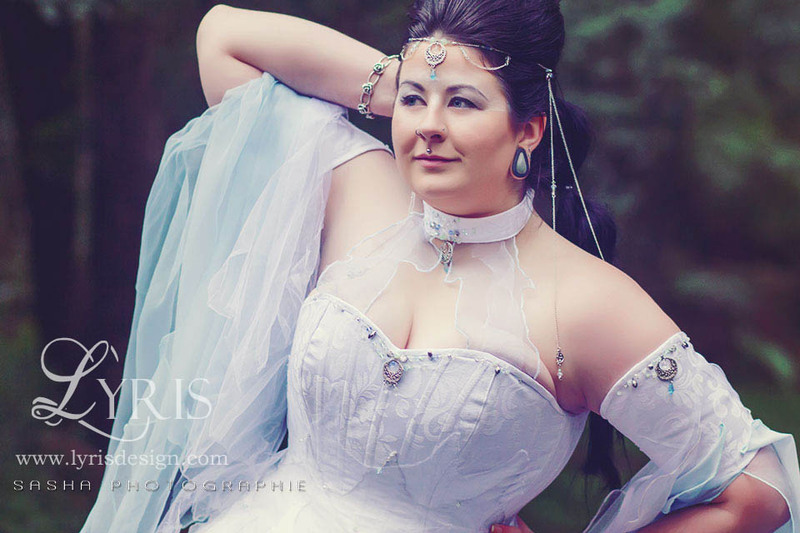 I absolutely love being given the freedom to design an entire outfit, from corset to gown and matching accessories. 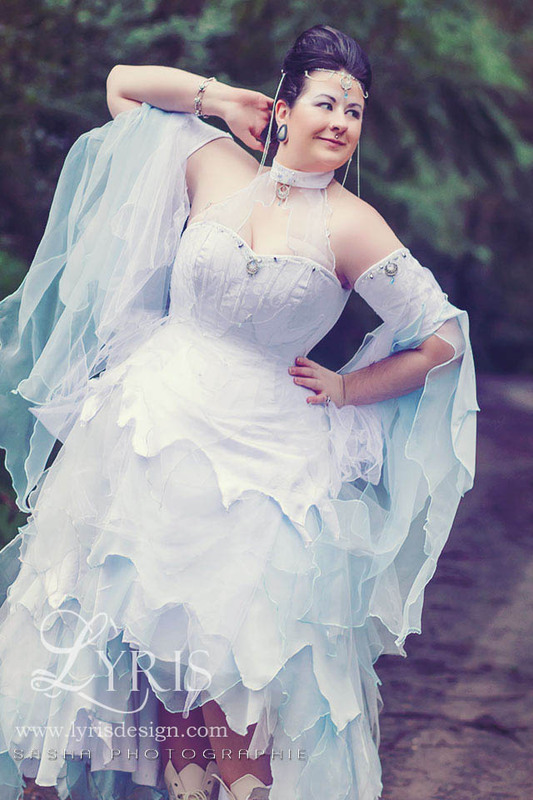 I used rich white brocade for the corset, melding into many layers of white, silver and pale blue chiffon, tulle and organza to give the feel of clouds floating around the moon. The neckline of the corset is beaded with Swarovski crystals, with more crystals scattered throughout the layers of the gown. Though not visible in these photos, there are also tiny LED lights beneath the skirt, to give the effect of stars. The headpiece was made from silver chain and matching crystals and silver work. This corset presented some really fun and sometimes challenging aspects. Eden’s wonderfully curvy figure was a delight to pattern and craft for, but did require some adjustments in the toile. The main issue was bust shaping and support. The final corset gives her a lovely shape, but the one thing I would change in the future when working with very large busts is to add an extra panel over the bust to better distribute some of that curvature. Her latest overbust corset implements this, which I will share with you soon! Making the transition from corset to corset dress also presents some small design challenges in regards to shaping and ease of access. The lacing panel has to be substantially lengthened to allow the wearer to put it on, without being so long as to make sitting uncomfortable. A zip was also required at the base of the lacing panel to facilitate this. The corset was quite longline on the hips to smooth the transition from the hip spring into the lines of the skirt. I have lots of extravagant designs planned for this year! I look forward to sharing them with you, and I hope you enjoy my work. 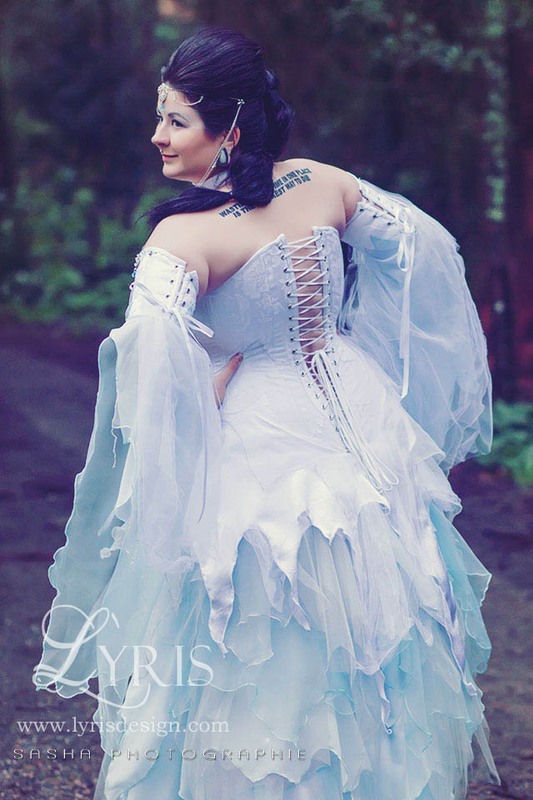 These photos were published in Strange Beauty Magazine Vol.6, and the first version of this post was published on Stitched Up Corsetry! Check them out, and please visit the pages of and support the lovely Eden, Sasha Photographie and Gorejess Designs. Thank you!